1943 England, when all hope was threatened by the inhumanity of war, C.S. Lewis was invited to give a series of radio lectures addressing the central issues of Christianity. More than half a century after the original lectures, they continue to retain their poignancy. First heard as informal radio broadcasts, the lectures were then published as three books and subsequently combined as Mere Christianity. C.S. Lewis proves that "at the center of each there is something, or a Someone, who against all divergences of belief, all differences of temperament, all memories of mutual persecution, speaks with the same voice," rejecting the boundaries that divide Christianity's many denominations. This twentieth-century masterpiece provides an unequaled opportunity for believers and nonbelievers alike to hear a powerful, rational case for the Christian faith. Webmaster's Review: It's hard to discuss Fantasy and Christianity for any length of time without bringing up C.S. Lewis. Mere Christianity is one of the reasons why. With simple language but without dumbing anything down, C.S. Lewis explains Christianity. Against the backdrop of World War II England, he covers the logic behind the religion, the balance between faith and morality, and the very nature of God. But Lewis never forgets his own humility or humanity, he is by his own admission not saying anything new, but merely repackaging some very old thoughts and truths. The core of Christianity, beyond the rules, the dogma, and denominations, is to become like Christ. Lewis covers more in depth what that means. It is both a challenging and reassuring view of our place and purpose. Being a man, Lewis has his limits (most of which he admits openly when touching on certain subjects). At the time, he was still single, and I found some of his thoughts on marriage a tad lacking. The conclusions were fairly in line with Biblical teachings, but the reasoning behind it felt incomplete. However Lewis admits his lack of first hand exprience, and the subject is only a small portion of what is covered. What he spend far more time on, which I saw as potentially confusing, is the subject of time. Here Lewis speculates on something which might explain certain Christian beliefs but is not a Christian belief in and of itself. Again however, he prefaces this talk by saying it is an idea to be taken up if you find it useful and left alone if you do not. While I have some different theories on some of the finer points of the theology Lewis present, the most important part to us (mankind) is the nature of the relationship between God and man, and that Lewis has described very well. It is not so important after all for the actor to understand the job of the electrician, but it is very important that he know his own part in the play. 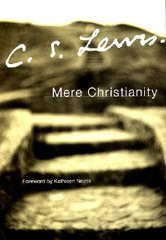 Whether you are a Christian or simply curious (or even skeptical) about Christianity, Lewis presents a wonderful primer that won't insult your intelligence.